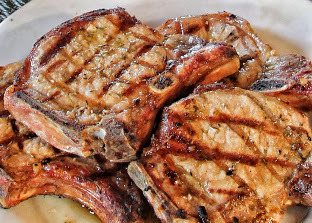 My husband, Bob, has been grilling perfectly juicy pork chops for years so I thought I’d share his method with you. I’m also including my recipe for a garlicky rub but you can use this cooking guide no matter how you season your chops. Make sure you get nice thick pork chops with the bone in! Chop garlic and add salt, spices and olive oil to make a rub. I just make it right on the cutting board, no need to dirty another dish. Divide the rub among the 4 chops and massage thoroughly on both sides. Allow the chops to sit at room temp for 20-30 minutes before grilling. You may also refrigerate them in the rub for up to 24 hours but be sure and still allow them to sit at room temp for 20-30 minutes. You don’t want super cold meat hitting the grill. About 15 minutes before you plan to grill the chops, preheat your grill on high heat to 55o degrees F.
Place the chops on the grill, close the top and sear for 2 – 3 minutes on one side (spin around halfway through to get the crisscross pattern). Turn them over, close the top and sear for another 2 minutes. Reduce the heat on your grill to 350 degrees F and allow chops to cook until they reach an internal temperature of 135 degrees (for medium rare) to 150 degrees (for medium well), the temperature will rise about 10 degrees while resting. Cooking time should be approximately 30 minutes but will vary due to the thickness of chop so check them after 20 minutes. It’s very handy to have an instant read meat thermometer to keep the guesswork at bay. Transfer the pork chops to a platter, cover with aluminum foil, and allow them to rest for 10 minutes before serving. I am so feeling the following quote these days. I’m definitely suffering from information overload, especially negative information overload! Time to unplug for awhile.